Knowing the common causes for clogs—and how to unclog a garbage disposal—is key to keeping money in your wallet instead of down the drain with costly repairs. When faced with the conundrum of how to unclog a garbage disposal, most people would agree the easiest solution is to simply call a plumber. However, the easiest choice may not always be the fastest or most cost-effective solution. So, why not try your hand at fixing the problem with a few simple home remedies before calling in the professionals? If successful, handy homeowners could save time and money, while gaining valuable DIY experience—and confidence for future repairs—at the same time. For homeowners attempting repairs, the first thing to do is turn off the breaker that controls the disposal—a successful home repair will never be remembered as much as a trip to the emergency room. Once the breaker is turned off, shine a flashlight into the clogged disposal. Do you see any objects that could be causing the clog? If so, carefully use a pair of long-handled tongs or pliers to retrieve these items and clear the way. Once all visible items have been removed, turn the breaker back on, and then turn on the disposal. (It may be necessary to push the reset button on the disposal.) If it drains water and works properly, congratulate yourself and be sure to tell everyone it took hours to fix (kidding); otherwise, continue on. Again, turn off the breaker. With no more foreign objects to retrieve, it’s time to consider another cause for the clog: lingering leftovers. 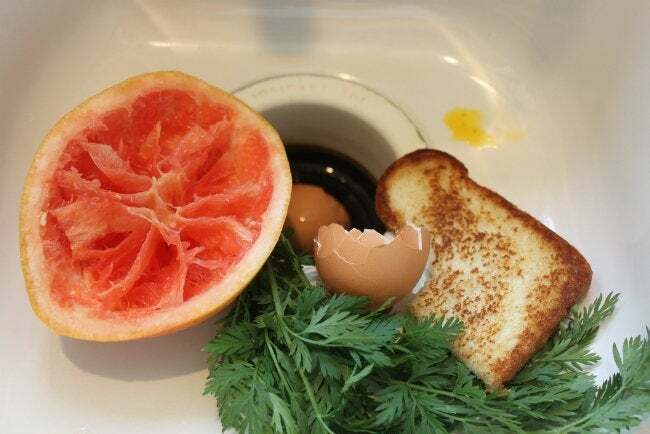 Food can clog garbage disposals when it isn’t broken down enough to be flushed out of the drainpipe. In these situations, it’s helpful to use a plunger first to try to loosen food that has clogged the disposal. After covering the drain completely with the plunger, allow water to cover the edge of the plunger and plunge the drain a few times. When finished, see if water will drain—a good sign that scraps might also do the same. If so, turn on the breaker and disposal to see if the food remnants can now be processed through the drainpipe. Should it work, add a notch on your DIY belt. If not, it may be time to prepare a cocktail—for the clogged drain, that is. Ensuring the breaker and disposal are both off, pour ¼ cup of baking soda in the garbage disposal. Next, pour ½ cup of white vinegar over the small pile, and be prepared for fizz and foam. Because many garbage disposals contain plastic parts, harsh drain cleaners can be detrimental. The combination of baking soda and vinegar ultimately offers the same type of unclogging ability, but on a much gentler scale. After five to 10 minutes, turn the breaker and the disposal back on. Then run hot water into the disposal for another few minutes. (Again, the reset button may be necessary to get it started.) If it works properly, call it a day and make yourself a cocktail this time. If not, you may want to consider calling in your last resort: the professionals. Turn off everything and call a plumber. But the job isn’t done after your pro clears up the problem and goes on his way. Remember to do your part by putting half of a lemon in the disposal every 2 to 3 weeks to keep the blades operating properly and the disposal smelling as fresh as your newfound respect for plumbers—this 2-minute maintenance can save you hours of headache down the road.